Fans will definitely know Len Peralta from his illustration work on Munchkin The Guild booster, based on Felicia Day's hit web series The Guild. 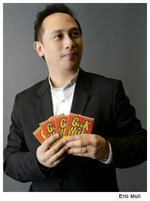 He is the creator of the Geek-A-Week podcast and has illustrated several children's books and graphic novels. You can see all of his projects (as well as hire him!) on his site. If you'd like to meet Len Peralta, he is doing signings at Gen Con on Friday and Saturday, from 12 pm - 1 pm.